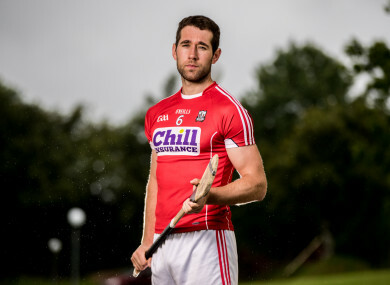 Mark Ellis is back available for the Cork hurlers. DEFENDER MARK ELLIS is back in contention for the Cork hurlers ahead of Sunday week’s All-Ireland senior semi-final after his recent injury problems, while U21 pair Darragh Fitzgibbon and Robbie O’Flynn are both available despite being forced off in the recent Munster U21 final win over Tipperary. Ellis has been sidelined since Cork’s draw with Limerick in Páirc Uí Chaoimh in early June, missing the subsequent ties against Waterford and Clare. Fitzgibbon was replaced in the first half of the U21 decider due to illness while O’Flynn limped off in the second half but both have resumed full training since. Squad members Patrick Collins and Darren Browne are Cork’s main injury concerns ahead of the clash in Croke Park against Limerick on Sunday 29 July. “Mark Ellis is back training for the last two training sessions, (he’s) gone well,” stated Cork boss John Meyler this afternoon. “Darren Browne has a slight hamstring problem. Pa Collins has a back injury. So Pa and Darren (are) probably doubtful, Mark should be okay. He came through training over the weekend and (we’re) training tonight. Erins Own player O’Flynn has had his share of setbacks this season after being taken off in the Munster opener against Clare when he suffered a heavy knock to the head. He has recovered from the concussion he sustained in that game. “He’s fine, he took the required period off, four weeks off,” said Meyler. The Cork boss also hailed the contribution made to the squad’s cause by Alan Cadogan, ruled out due to a long-term knee injury. “Alan has been a huge part of Cork hurling over the last few years. He’s really made a huge impact. It’s great to have a guy like that around the place. He’s positive, makes a contribution. Email “Defender Ellis available for Cork and U21 duo fit after Munster final withdrawals ”. Feedback on “Defender Ellis available for Cork and U21 duo fit after Munster final withdrawals ”.